Water-cooling. Most everyone knows the pros and cons. 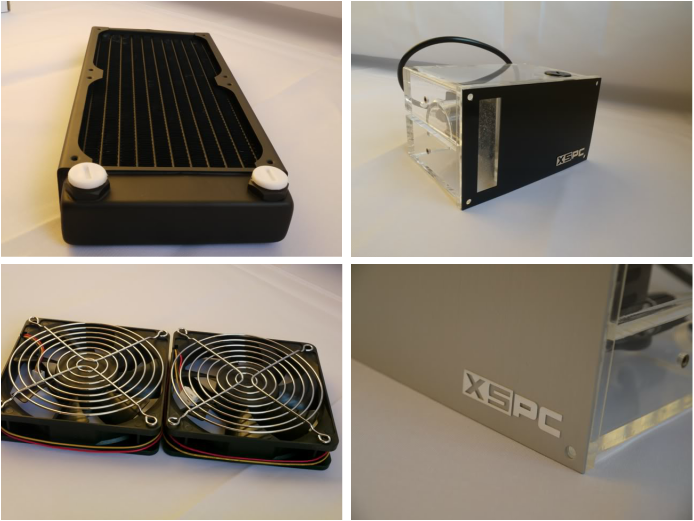 If you're one of the many who's been wanting to get into the liquid-cooled scene, but have been put off by the expense and complication of custom loops or the mediocre performance of some self-contained units, take a look at the new Rasa 750 RS240 water cooling kit from XSPC. When I saw this kit at Overclock.net, I knew I had to check it out. Presented by well-known water-cooling manufacturer XSPC, this kit looks to have everything the aspiring water-cooler could need to get started, and at a very affordable price point. These guys were on the ball as usual and had the kit in my hands in three days. Let's take a look at it. Everything needed to cool just about any CPU on the market. The 750 kit is compatible with AMD socket 939,754,940,AM2 and AM3, as well as Intel Socket LGA1366,LGA1156,LGA775,603 and 604. The brown cardboard box provides no fanfare the delights inside. XSPC have not wasted money on fancy packaging, rather choosing to invest the money where it matter, in the quality of their products. Inside we find practically everything we need to build our very own semi bespoke watercooling loop. I say practically everything as XSPC have chosen not to bundle a coolant with the kit. I can see the logic in this decision as it leaves the builder the choice of which coolant they prefer to use, and of course, as it comes bundled with clear tubing, more importantly what colour coolant they want to use to best compliment the colour scheme of their rig. I think it fair to say that's quite a lot of kit for your cash. You may be thinking "yeah but I bet it's all really crappy quality and bargain basement stuff" and I have to say it was with this thought in mind that I apprehensively I examined the contents of the box. Well I'm pleased to report that there's no crap to be found. it's all good stuff in there. I'm not going to go into great detail with regards to every little item, however a few bits and pieces deserve a special mention. A dual bay design measuring 277 x 121 x 35mm (shorter than the early model of this drive bay res to allow greater flexibility of mounting on smaller cases). It is made from clear crisp acrylic. The acrylic is either 6mm or 13mm where extra strength is needed. All mounting holes have Brass inserts to reinforce and strengthen them and so reduce the risk of cracking the acrylic with over enthusiastic tightening of fittings. 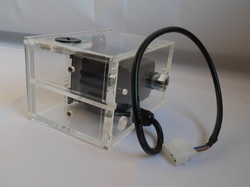 In addition to containing the coolant the reservoir also houses the system's pump. The pump is an 12Volt unit, with a head pressure of 2.1 metres and a flow rate of 750 Litres per hour (Ah that's where the 750 in the name comes from). it does seem to occupy quite a large amount of the internal capacity of the res, but that's not to say there isn't sufficient volume remaining for the coolant. XSPC have very thoughtfully included a choice of 2 face plates for the pump, Both are brushed Aluminium, one in black, the other is silver. 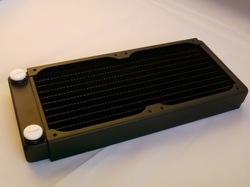 The Rasa Block has already established itself a reputation in the watercooling fraternity, and it's good to see XSPC using the black finished variant in this kit as opposed to a cut down bargain block. The Block comes pre assembled for Intel mounting but can very easily be altered to for mounting onto AMD chips.. 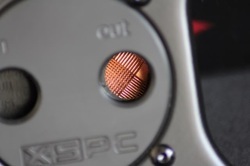 The copper heatsink is machined flat and as you would expect highly polished. Inside the block we find a 1200 diagonal cut 0.25mm pin matrix. What this means in real terms is that the copper block has been cross cut by a CNC lathe to leave 1200 0.25mm thick "pins". The purpose of these pins is to present a high surface area to the water flowing over them and as such maximise heat transfer from the block to the water. Back to the outside of the block and we see that XSPC have placed the inlet and outlet a good distance apart so that should you so desire even chunky 3/4 OD compressions can be used. As the name of this kit suggests theRS240 Radiator forms an integral part of this assembly. Being of the slim line design and measuring only 277mm x 121mm x 35mm (LWH) the Radiator is suitable for installation into not only full size tower cases such as the large Lian Li cases, but also the smaller cases such as the CM690. The radiator has 14fins per inch dissipating heat from a single row of 19 brass water channels. As per the rest of the kit, the radiator is threaded for G1/4" fittings. The radiator supports the mounting of two 120mm Radiators with a standard fan spacing of 15mm having used a few Radiators in my time I can report that the level of quality here is high. there was no evidence of bent finds or uneven paint distribution as can so often be the case with other manufacturers radiators. Up to now it's all been pretty rosy. The Radiator is good, the pump is good and the reservoir is good. The instructions however are not good. Although there are some very nice colour copied instructions that cover how to mount the CPU block onto an Intel Chip, and for some inexplicable reason on the reverse side instructions for how to mount the XBOX 360 CPU/GPU Waterblock. What's missing entirely are the instructions on how to put the rest of this together. Now if you're a seasoned Watercooler and have installed a few loops in your time then you can pretty much suss it out. if however you're one of the target audience for this kit and are venturing into watercooling for the very first time then the total dearth of instructions may be something of a concern to you. Sure there is enough info out on the internet to enable you to work out what goes where and how, but you shouldn't have to chase this information around. If you bought a car you wouldn't expect to have to go on line to find out how to turn the headlights on, you'd expect it all to be there in the instructions. Putting a watercooling loop together can never be described as simple, and it has to be said the lack of instructions do not make the process easier. But we're men right! If we had instructions we wouldn't read them anyway would we! So let's put that paltry matter aside for a moment and assume that you've done your research, you've been on line and looked at how to put a loop together, you've decided whether you want your fans to push or pull, you've worked out how and where to mount your radiator. You've also determined the optimum route for the tubing through your case. So how easy is the loop to put together? Well about as easy as any other loop save that you have the quiet confidence of knowing you have to hand everything you need. This Kit has been well tested by many review sites on the web and has been shown to perform very well indeed. This is a man on the street review, so i'm not going to be filling the next few pages with reams of graphs you're probably not going to read. I am however pleased to report that my own experience of the kit did nothing to detract from the experience of others. One thing I haven't mentioned so far in this review is the ability of the consumer to expand their set up at a later date. Perhaps by adding a GPU leg to the loop (there's certainly enough tubing available). You may need to add an extra Rad? The pump has the ability to cope with another 120.2, so no worries there. 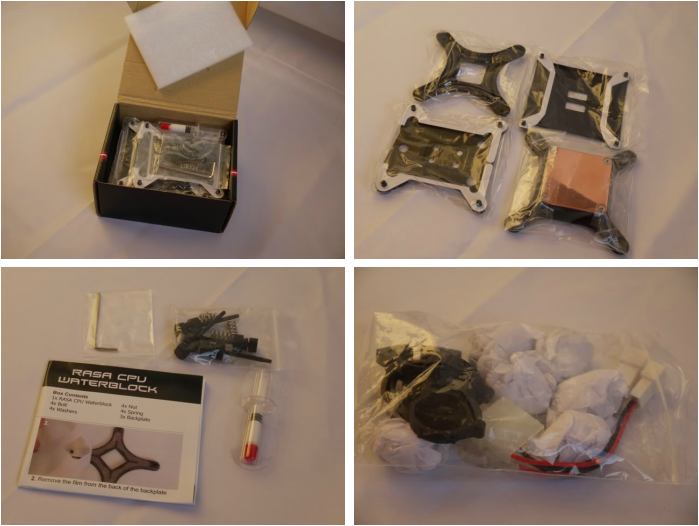 Want to upgrade your CPU block but keep the rest of the kit/ again no problem. This kit is like a Bacon Brie and Sundried Tomato Panini. Let me explain. Whether we're talking about the dream deli sandwich or the XSPC kit each of the ingredients here is delicious in it's own right. When brought together with the right sort of quality garnish however the combined effect is much greater than the joy that can be derived from each of the ingredients on their own.